At one time it was thought that a prime coat was an essential element of good asphalt pavement construction. However, asphalt prime materials and the gradation of aggregate bases have changed over the years and applications of prime are no longer necessary for most asphalt pavements. In fact, their use can be detrimental to pavement performance. This has led the Virginia Department of Transportation (VDOT), many state and municipal DOT’s as well as other engineers to remove the requirement from their specifications. According to studies performed by The Asphalt Institute over the last 20+ years, few if any, pavement failures can be attributed to the lack of a prime coat. The following is a brief explanation of what prime coats are, what materials are typically used, and why its use has been discontinued by the Virginia Department Of Transportation and other specifiers. A prime coat is an application of a low viscosity asphalt to a granular base in preparation for an initial layer (or surface course layer) of asphalt. Coat and bond loose material particles on the surface of the base. Harden or toughen the base surface to provide a work platform for construction equipment. Plug capillary voids in the base course surface to prevent migration of moisture. Provide adhesion between the base course and succeeding asphalt course. For a prime coat to be effective it must be able to penetrate into the base course. Typically a light grade of medium curing cutback such as an MC-30 or MC-70 will work well. However, these are cutback asphalts (asphalt cement by combining it with light petroleum oil) and “cure” or harden when the light oils evaporate into the atmosphere. As the light oils evaporate they release hydrocarbons into the air causing air pollution. As a result, EPA has severely restricted or eliminated the use of cutbacks for most areas of the U.S. Virginia Department Of Transportation (VDOT) discontinued the use of cutbacks more than 30 years ago when Virginia agreed to severely restrict the use of cutbacks in the late 1970’s as an offset to the emissions from a proposed oil refinery on the Chesapeake Bay. The refinery was never built but VDOT has stayed with emulsified asphalts (asphalt cement liquefied by suspending it in water) for surface treatment (chip seal), slurry seal, tack and prime applications ever since. At one time it was thought that a prime coat was an essential element of good pavement construction. 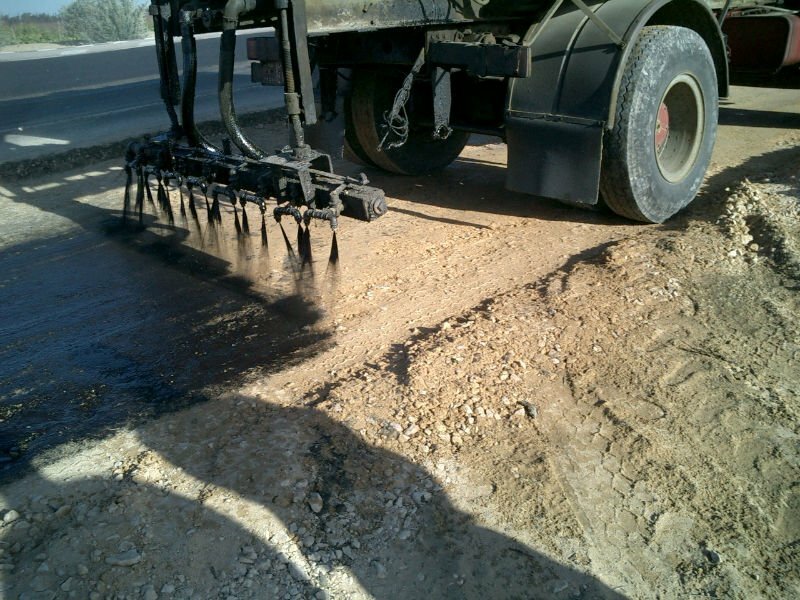 Aggregate base/subbase materials were more “open” or coarsely graded than today’s materials so it was necessary to bind the upper 1-2” together by spraying a heavy application of liquid cutback asphalt on the surface and allowing it to penetrate into the aggregate before “setting” or hardening. This formed a hard, waterproof surface and provided a good platform for the asphalt paving train. However, the gradation of aggregate materials changed with the emphasis on achieving high density in base and subbase layers. These new, finer gradations have more fines and proper compaction results in a very hard and almost impervious surface. 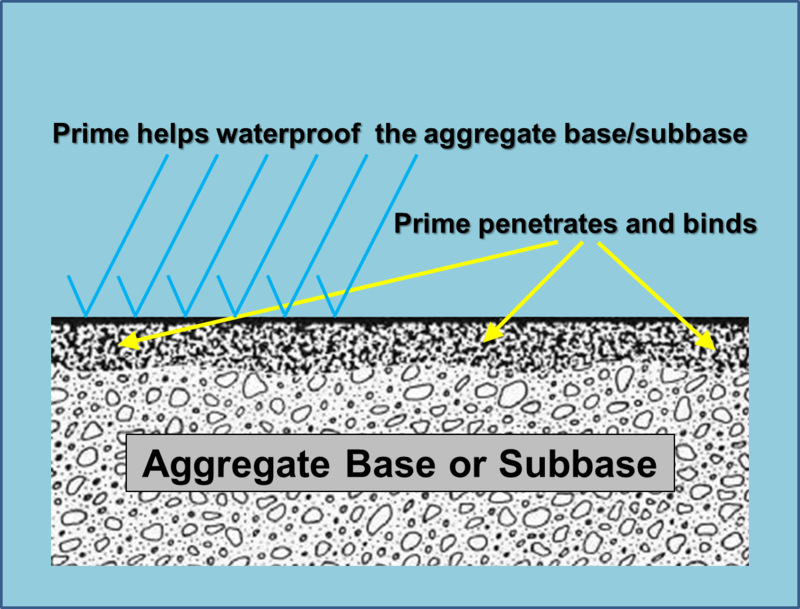 As a result, prime materials no longer penetrate into the aggregate layer, solidifying instead as a heavy film on the aggregate base/subbase surface. This can be detrimental to the bond between the asphalt concrete and aggregate and can result in slippage failure of the asphalt. Having a thick, gummy layer of asphalt on the surface of the aggregate is also problematic for the paving train, sticking to the equipment tires, particularly the asphalt haul trucks. Other states DOT’s, county and municipal DOT’s, state agencies and engineers have come to the same conclusions as VDOT, no longer specifying a prime coat on unbound aggregate base and subbase materials. Where do I find VDOT’s Language Eliminating Prime? The language quoted above can be found in Section 315.05(b)1(a) or you can follow the following links to VDOT’s website VDOT website for Special Provisions on page 3-115 title “Priming aggregate base or subbase”.